Your-search.com is the PUP that uses misleading techniques to prevent removal. Use Reimage to locate malicious components and get rid of them faster than with uninstall instructions. A full system scan blocks virus reappearance and prevents traffic to malicious domains. Your-search.com is a suspicious search engine developed by ClientConnect Ltd. 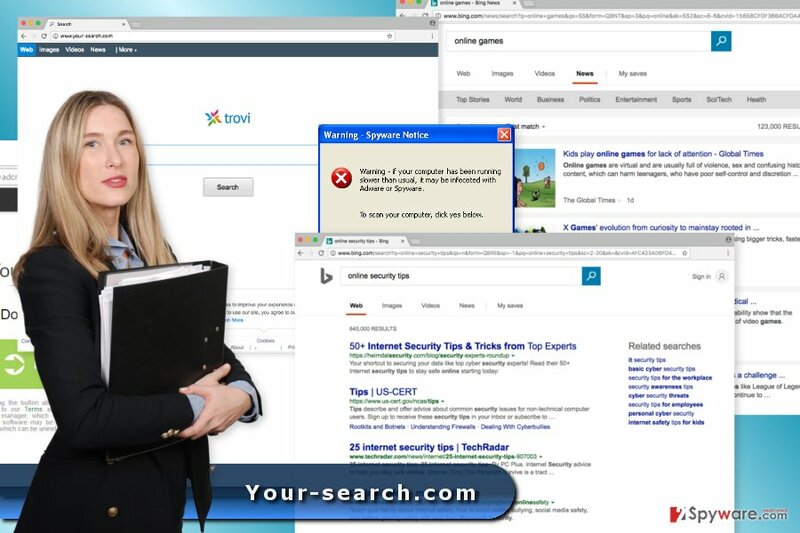 The program is also known as Trovi search which is a fishy browser hijacker that is capable of altering search results. The hijacker collects information in order to display targeted ads. Personalized advertisements are supposed to be engaging. When users click on them and visit affiliates’ website, developers of Your-search.com generates revenue. Such activity is absolutely legitimate and popular among developers of free programs. However, the problem is that some of the ads delivered by this shady hijacker might be misleading and lead to potentially dangerous websites. For instance, you might encounter pop-up suggesting to install a suspicious program. Therefore, you should not be tricked by the appearance of Your-search.com. At first glance, it barely differs from ordinary search engines. Simply designed tool allows the web, images, videos and news searches and redirects searches to Bing. However, if you would like to use Bing as your primary search engine, you should set it directly. Otherwise, you have to remove Your-search.com in order to avoid malicious advertising. We want to point out that hijacker might be resistant. Thus, replacing its URL with another domain will end up with a failure. In order to get rid of this program, you need to investigate the system and delete all hijacker-related components. There might be a dozen of PUPs and files installed without your knowledge. What is more, the hijacker is capable of altering registry and various shortcuts to strengthen its presence. As a result, manual elimination might be complicated. For this reason, we recommend employing Reimage or another security software. After the infiltration, Your-search.com becomes browser's default search engine and starts spying on its users. Authors of this search engine rely on bundling. It’s deceptive software marketing method that takes advantage of user’s bad habits to rush with software installation. The PUP is usually added in software package as an optional component and hidden under Quick installation settings. When users want to save their time and opt for quick installation, they give indirect permission for all PUPs included in the package to get inside the computer. In order to avoid hijacked web browser and installation of undesired browser extensions or program, you have to opt for Advanced or Custom installation method. Differently than the Quick mode, Advanced settings reveal the list of third-party programs and allow rejecting their entrance. You can stop them by unmarking pre-selected entries. Your-search.com removal requires not only resetting your browser but uninstalling suspicious browser extensions and programs as well. If you prefer, you can complete this task manually. Please check the instructions below, and if they seem clear, start this procedure right now! However, there’s an easier way to get rid of the hijacker. You can quickly remove Your-search.com using reputable anti-malware or anti-spyware. Updated security software can quickly locate virus-related files and delete them. In order to set free your browser from the hijacker, you have to check the system and uninstall suspicious programs. We suggest sorting the list of programs by date and look up for unknown applications. Here, look for Your-search.com or any other recently installed suspicious programs. Check the list of Applications. If you find some unknown entries, move them to trash immediately. Wait until you see Applications folder and look for Your-search.com or any other suspicious programs on it. Now right click on every of such entries and select Move to Trash. Your-search.com virus might have altered settings of Internet Explorer. Follow the steps below to reset the browser and use it normally again. When in the new window, check Delete personal settings and select Reset again to complete Your-search.com removal. After the hijack, it's important to clean Microsoft Edge from all suspicious components. Once these steps are finished, Your-search.com should be removed from your Microsoft Edge browser. 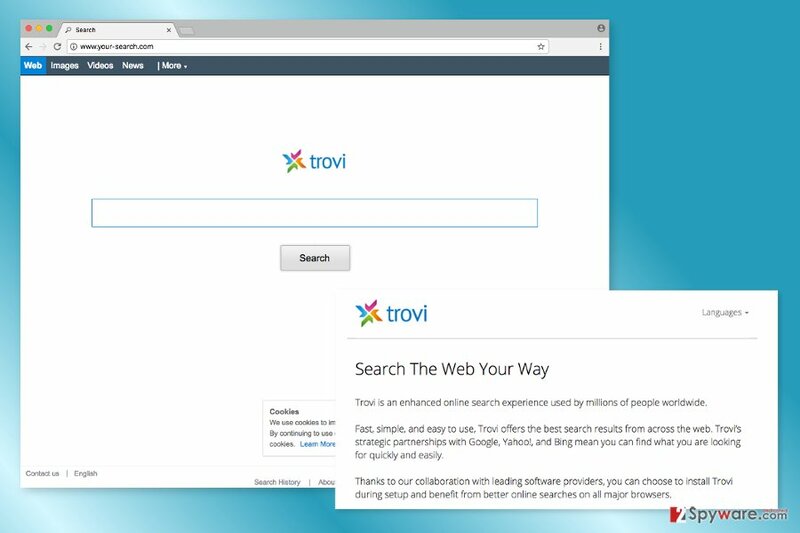 From the list of extensions, remove all the entries that might be related to Your-search.com and Trovi. Then reset Firefox in order to get rid of tracking cookies. Here, select Your-search.com and other questionable plugins. Click Remove to delete these entries. Now you will see Reset Firefox to its default state message with Reset Firefox button. Click this button for several times and complete Your-search.com removal. The final step requires uninstalling unknown extensions and resetting Google Chrome. Here, select Your-search.com and other malicious plugins and select trash icon to delete these entries. Click Reset to confirm this action and complete Your-search.com removal. Here, select Extensions and look for Your-search.com or other suspicious entries. Click on the Uninstall button to get rid each of them. Here, look at the Homepage field. If it was altered by Your-search.com, remove unwanted link and enter the one that you want to use for your searches. Remember to include the "http://" before typing in the address of the page. Now you will see a detailed dialog window filled with reset options. All of those options are usually checked, but you can specify which of them you want to reset. Click the Reset button to complete Your-search.com removal process. ^ FaraVirus. FaraVirus. Romanian website about recent computer infections. ^ David Kirkpatrick. Study: 71% of consumers prefer personalized ads. Marketing Dive. Digital & Online Marketing News and Tips. ^ Ryan Frazer. Malvertising Awareness: How Advertisements can spread Malware. Securable. The official site of the cyber security company. This entry was posted on 2017-07-13 at 09:13 and is filed under Stealing programs, Viruses. You can quickly scan the QR code with your mobile device and have Your-search.com virus manual removal instructions right in your pocket. How did you remove Your-search.com virus?